Villa Poggio al Santino is situated in Maremma, about 6 km far from the marvelous beaches of Castiglione della Pescaia, while Florence, Siena, Pisa can be easily reached within a short time. The stone Villa is a completely independent structure with its own swimming pool and garden, playground, 2 manèges and a tennis court. The Villa is based on a hillock from which it is possible to have an awe-inspiring view upon the sea, the structure has been lately restored with the main goal of creating an elegant place to gift guests with relax and comfort. 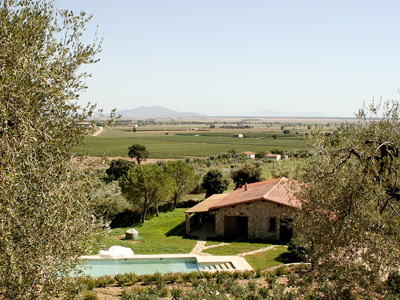 The Villa lies on a hilly area, surrounded by olive groves, vineyards and Mediterranean scrubs. The proprerty is a few kilometers away from Grosseto and from Castiglione della Pescaia, you can enjoy cycling and walking excursions and going to the beach. It is located near Giglio's island , even Saturnia's thermal baths are easily accessible. A paved road leads to theVilla that has a motorized sliding gate supplied with remotecontrol. Guests are allowed to make use of the tennis court, the horse manages for horse riding (only if they own one their selves, that can be guests in our paddocks) and the well equipped panoramic area on top of the hillock. The Villa is situated a few kilometers away from Castiglione della Pescaia where a wider range of shops, restaurants and taprooms are available. Castiglione della Pescaia is just 6 km away from the Villa.